The score is currently standing at Joanna Lumley 1 : Tamara Essex 0. But I’ll even it up some day. There was just one thing left on my Bucket List. And this month I set off to achieve that final “tick”, on an evening flight from Bournemouth up to see the Northern Lights. It was a Christmas / birthday / Easter / Hanukkah present all rolled into one for my friend Margaret, who has wanted to see the Northern Lights for years. I don’t know how I’d managed to keep it a secret for the six months since I’d booked it. I’d told Margaret she had to keep the evening of March 26th free, and preferably not book an early meeting the following morning. She was intrigued, and begged to know what was planned. Indeed, she was so curious that she Googled the date, and discovered that boy-band One Direction were performing a little way along the south coast. She spent the next five months wondering how she could possibly look adequately grateful! Finally I had to tell her to bring a camera and her passport (I told her that security required a passport because I’d got us backstage passes to meet “the boys”). At the airport we were given a presentation on the stars and planets we would see. 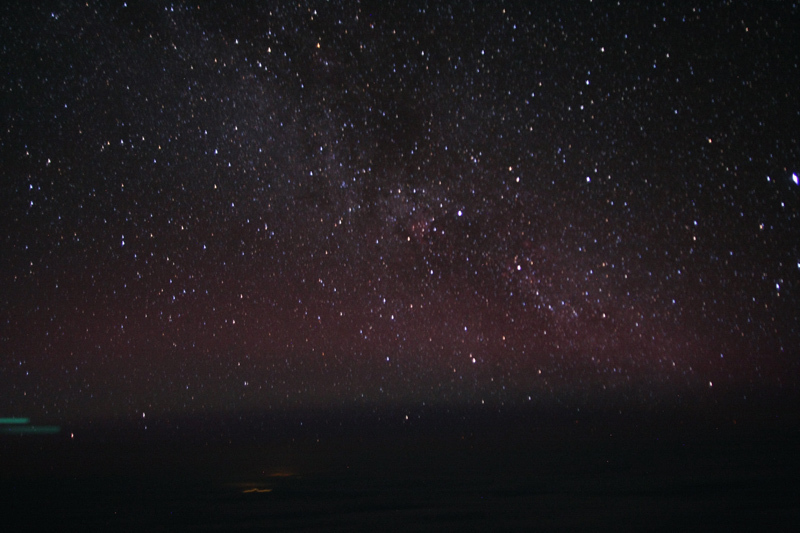 The astronomers, who would accompany us on the flight, explained that there had been 21 “Lights Flights” so far this season, and good views of “the wall of red” had been seen on 20 of those, a success rate of better than 95%. This is because on a land-based trip to see the Lights, there is a high risk of cloud cover, but on these flights we remain above the cloud so should get a good view as long as the lights are doing what they do to create those amazing walls of green and red. It’s all to do with magnetic polarity – I understood it when he explained it with PowerPoint but the finer details seem to have slipped my mind just now ……. On board there was a long explanation of how to ensure our cameras were set to not flash, and every bit of light from phones and cameras needed to be covered with black electrical tape. The cabin went dark. Even the wingtip lights went out. We all had to hold our cameras above our heads, and on the count of three we pressed the shutters. Not bad, just one person had one remaining orange focus light that needed covering with tape. Then we were in total blackout. As we reached the site, just south of Iceland, the stars were extraordinary. With no distracting man-made light sources they seemed enormous, and ridiculously bright. The constellations and clusters we’d been told about were there, right outside the windows. The astronomers pointed out all there was to see. But the real star of the show eluded us. 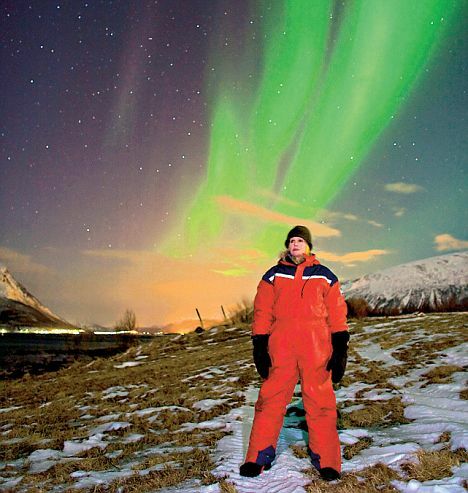 The 22nd flight of the season became the second to fail to see the Northern Lights. We saw a bit of a red dusty tinge, and stared desperately at it, willing it to burst into the amazing light displays that greeted Joanna Lumley in that wonderful documentary. But the polarity refused to reverse itself (which is what would have kicked off the display) and eventually the pilot had to turn for home. I genuinely enjoyed it, and just being up amongst the stars in a totally blacked-out plane was a great experience. But I still want to see the Northern Lights. And one day I will. 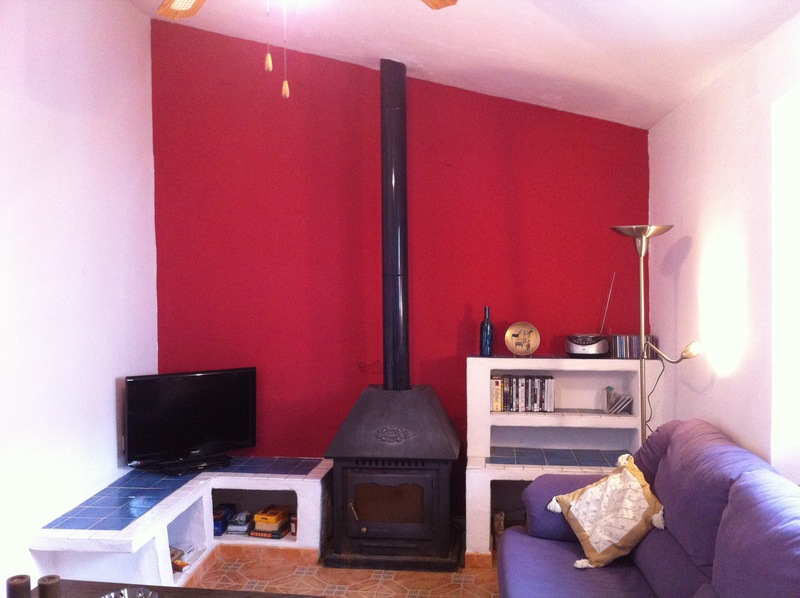 So then it was back to Colmenar, where in my absence Laura had cleaned the smoke-damage from my walls and repainted the room a bright white. Except for the end wall. I missed out this time on the Northern Lights, but Laura has given me my own “wall of red”. This entry was posted in Dorset, Spain and tagged Aurora Borealis, Colmenar, Northern Lights, Shaftesbury, Spain, SpanishBlog, Tamara Essex by tamaraessex. Bookmark the permalink. Now you realise you should have gone to see One Direction instead 🙂 Enjoyed reading, hope you ‘see the Lights’ one day! Seeing the Northern Lights is on my Bucket List too, and we will be trying to tick that particular one off this next coming winter. We will be missing out on our yearly trip Down Under to try to achieve it – so I really do hope we manage it! Another great read Tamara.I too have longed to see the Northern Lights since the fantastic Joanna Lumley documentary, wish they would repeat it on TV.One day we will all see it I am sure.We bought a telescope to look at the stars in the Summer we live in the campo and it always a lovely black sky in Summer. Sounds amazing, Tamara – even if you didn’t get to see the lights this time. And your living room looks gorgeous!